After 30 years of building spas for tens of thousands of families in over 50 countries, we are pleased to introduce our newest brand of spas called EQUINOX. Over the years we have learned to integrate our design expertise with the latest advancements in materials, technology and valuable customer feedback to maintain our position as industry leaders and innovators. Equinox Spas knows you have many choices and understands your investment in a spa is one that should not be taken lightly. Whatever your individual reasons are to start enjoying the benefits of living the spa lifestyle, we are committed to exceeding your expectations. 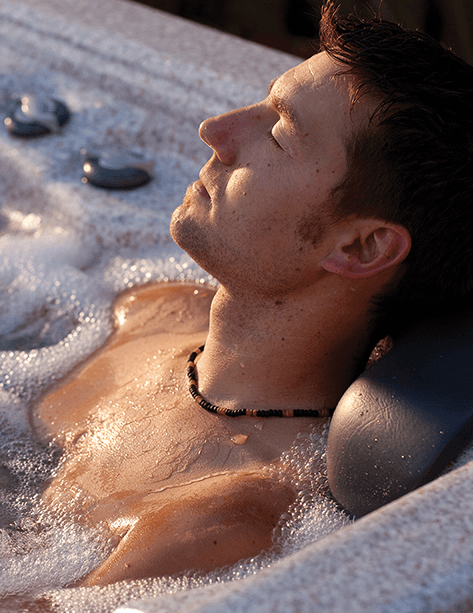 Although many spas may look similar, we assure you they are not built the same. Throughout your journey we encourage you to educate yourself, and then compare the design and construction techniques of an Equinox Spa found in this literature. Our GreenGuard Roxul Insulation System is an innovative and energy efficient insulation designed for Equinox Spas. Unlike urethane foam, which is commonly used in "foam filled" hot tubs, our lightweight stone fiber insulation is made from natural stone and other recycled content. While conventional spas use the "foam filling" process which can produce as much as 50 lbs of volatile organic compounds (VOCs) that are harmful to the environment, this system contains no chemical irritants and is resistant against the growth of mold, fungi and bacteria. The GreenGuard Thermal Retention System is made from inorganic and recycled content that is naturally noncombustible and doesn't include any dangerous chemicals. This environment friendly insulation has been tested and approved to GreenGuard Certification. As a green product, the thermal retention system increases the energy efficiency of our spas by up to 35% while providing superior sound absorbency, which means energy created by the spa, stays in the spa. Every Equinox spa starts with a solid foundation. Our polyethylene floor seals out critters and moisture while sealing in the heat. Integrated into the sealed floor is our galvanized steel frame. Engineered to provide the strength and stability required to support over 7000lbs. Unlike wood frames, our galvanized steel structure is built to last. Not only is it 10 times stronger than wood, it will not crack, warp or rot and unlike wood it will not sustain termites or rodents. The third component of our system is the polysteel cabinet system. Our polysteel cabinet is the only laminated enclosure on the market. The polysteel system provides superior insulating properties and unprecedented sound blocking characteristics. In addition to being completely resistant to rotting, cracking and peeling, our maintenance free cabinet has the look and feel of real wood. Equinox Spa's fiberglass shell is a seamless integration of superior quality components designed not only to function at the highest level, but to also be Earth Friendly®. The surface of our multi-layered shell starts with Lucite® acrylic. This cutting edge finish gives your spa an exceptionally smooth and luxurious feel as well as a robust lustrous look that is also resistant to UV rays. Co-extruded to the under surface of the acrylic is a layer of fiberglass for additional strength and stability. The benefits of Equinox Spas' fiberglass shell go way beyond the surface. All spa surfaces are fused to an understructure to create strength and support. Many manufacturers still use large quantities of styrene, a volatile and flammable pollutant, to support their spas. Equinox Spas' use of fiberglass ensures a more durable structure that will provide a lifetime of worry free strength while doing our part to protect the environment. All Equinox spas come equipped with our High Volume Teleweir Filtration. Our Teleweir Filtration helps collect unwanted particles floating on the surface of the spa water. Our dual core filter then traps disintegrated biofilm and any other water impurities. One easily removable "twist and lock" filter ensures maintenance is quick and easy. With our dual speed programmable pump that filters 100% of the water multiple times per day, you will know your Equinox Spa is always clean and clear.